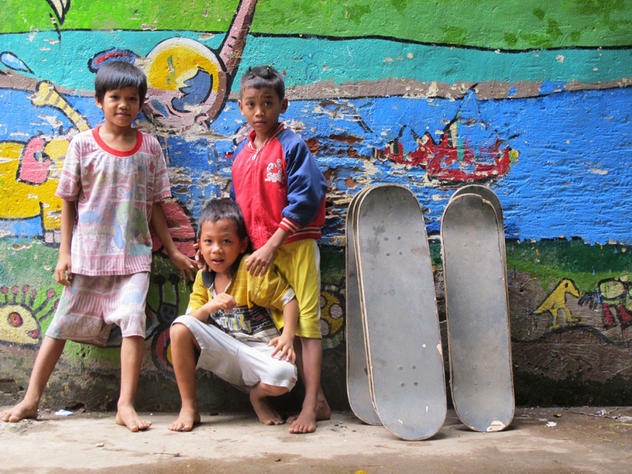 Quiksilver Foundation has teamed up with Skateistan to support their new project in Cambodia. Skateistan uses skateboarding as an educative tool to encourage respect, creativity and life skills for youth in Afghanistan and Cambodia, which helps them to grow and become more confident and united. As soon as Australian skateboarder Oliver Percovich dropped his board in Kabul in 2007, he was surrounded by the eager faces of children of all ages who wanted to be shown how to skate. Stretching out the three boards he brought, "Ollie" began dedicating himself to the creation of a small skate school in Afghanistan. The success with the first students prompted Ollie to think bigger by bringing more boards back to Kabul and establishing an indoor skateboarding venue. Skateistan has emerged as Afghanistan’s first skateboarding school, and is dedicated to teaching both male and female students. It aims to build indoor and outdoor skateboarding facilities in which youth can come together to skateboard: here, they forge bonds that transcend social barriers. Today, the Quiksilver Foundation, and its ambassador Javier Mendizabal, are partnering with Skateistan to lead a new project in Cambodia. As in Afghanistan, the objective is to build structures dedicated to skateboarding in order to offer the Youth the possibility to develop skills in skateboarding, leadership, civic responsibility, multimedia, and creative arts.